Performance monitoring and profiling are two different aspects. The former takes a more of a proactive measure whereas the latter is a reactive approach. In my experience, performance is an afterthought in most cases rather than being built into the software development life cycle. I see the same thing in most cases when it comes to security as well but let us not go there today as that lends itself to a different post. In order to monitor your application, you first need to understand what performance aspects the end users of your application expects. This would include throughput, response time, uptime etc. After you collate these information, the next step would be to create scripts for load testing your application. Coming primarily from a Java background, I normally use JMeter which comes with a user friends UI to create load testing depending on your use case be it database, Web Service, JMS etc. So you have your load testing scripts and it is running fine. What next? Well now that you have the load scripts in place, the next step would be note down what parameters you should monitor. Generally you would start out monitoring the CPU and Memory usage while your load test is in progress. 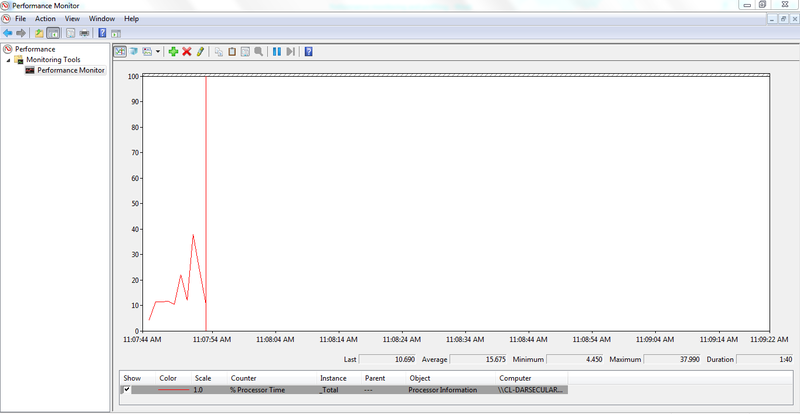 When you monitor CPU, you would be looking at the CPU usage as the application is being load tested. If there is high CPU usage, you need to further drill down to find out what issue might cause this. If there is low CPU usage, then probably you can try and increase the load to see what the optimum load that uses efficient CPU. 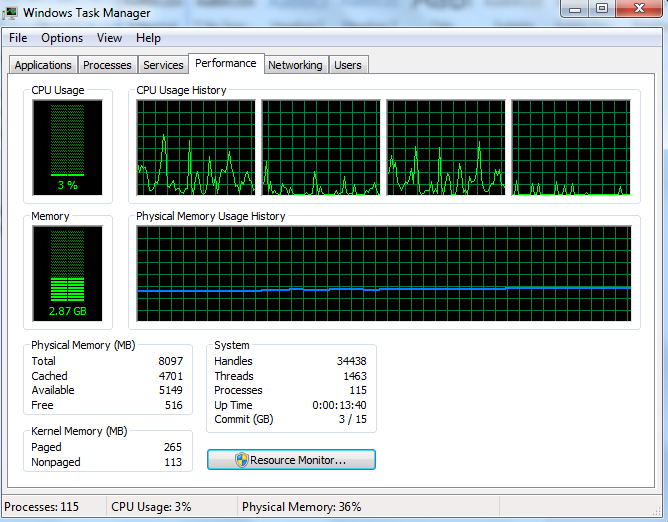 I’m running on a Core i5 with 8GB of RAM. 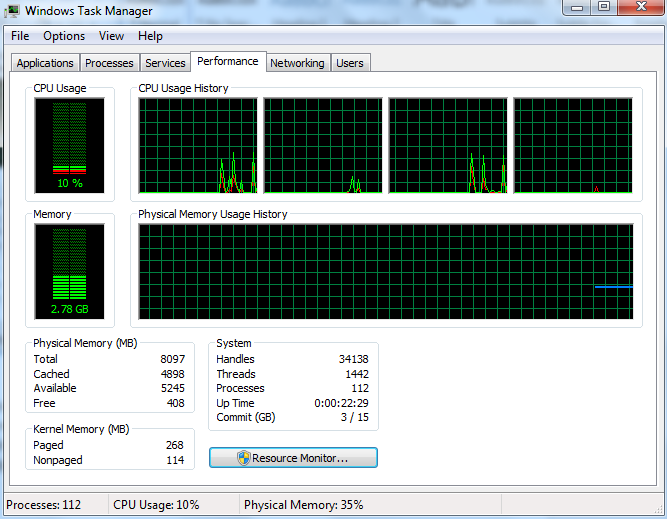 In the upper right hand corner you can see the CPU usage history. The four boxes here represent the four CPUs. You will get the same value if you run Runtime.getRuntime().availableProcessors() within a Java program. The space between the red line and the green line is the user CPU time. So what is the difference between the user and the kernel CPU time you might ask. User CPU Time : The amount of time the CPU spends on running your application code. Kernel CPU Time : The amount of time the CPU spends on operating system related activities. For example if your application does a lot of reads/writes to the disk, you will see high kernel CPU as it requires the operating system related functionality to be invoked. You can add any counter which you are interested in monitoring by right clicking on the graph area and selecting the Add Counters menu option. If you want to monitor the user CPU and kernel CPU, select the Performance object and under that you will find the User time and Privileged time (kernel CPU time) counters. Another key indicator to watch out for when monitoring CPU is the CPU schedule run queue. This is where all light weight processes needed to run are queued up waiting for CPU. As a rule of thumb, if your run queue depth is more than four times the available virtual processors on your machine, then you need to investigate your application further more to see what could be done. In the era of high memory machines, people often overlook the fact of using and writing efficient algorithms and data structures as there is plenty of memory available on high end servers. But the issue here is that many a times CPU is limited. If your algorithms/data structures do not scale well with added load, you will end up over loading your CPU with the only alternative being is to scale your application into different servers. So if you are having issues with the scheduler run queue depth, it is always best to see the possibility of writing certain sections of your application code in a more efficient manner so as to utilize your CPU better. The run queue depth can also be monitored using Perfmon by selecting Add Counters->System-> Processor Queue Length. Now that we have covered some of the important factors to look into in terms of CPU when monitoring your application, in the next post we will look at what aspects we need to consider when monitoring the memory usage. Please do leave by your comments and suggestions which is as always much appreciated as I love learning from the experience of others which I deem as invaluable.